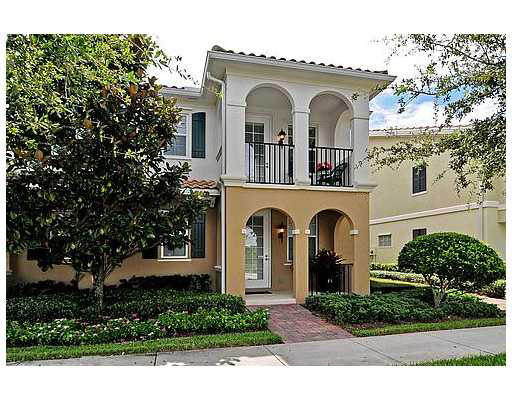 Divosta's San Palermo is Abacoa’s smallest townhome/duplex community, located east of downtown Abacoa. Built in 2003, these 34 Mediterranean-style three and four bedroom townhomes are surrounded by gorgeous landscaping, natural preserves and are in close proximity to shopping, dining and more! San Palermo at Abacoa Homes for Sale have 2 different townhome floor plan options for sale and for rent in Jupiter, Florida, both having 1867 square feet of living space with a detached two-car garage and huge private rear courtyard style patio separating the living quarters from the garage. Floor plan 1 has a master bedroom and 2 secondary bedrooms on the second floor with a fourth bedroom on the first floor with private entrance full bath and walk in closet. Floor plan 2 has 2 master bedroom suites on the second floor and the same first floor plan as the 4 bedroom model. Local schools near San Palermo at Abacoa include Beacon Cove Intermediate School, Independence Middle School, Lighthouse Elementary School and Jupiter Middle School. The high schools nearby are Jupiter High School and Dwyer High School, all part of the Palm Beach County School District. In addition, Abacoa is home to the Jupiter branch campus of Florida Atlantic University and the Harriet L. Wilkes Honors College. Comparable Jupiter neighborhoods include Tuscany, Charleston Court, and Martinique. For more information on Jupiter's San Palermo at Abacoa Homes for Sale and San Palermo at Abacoa Real Estate please feel free to call or text us at (561) 371-7550, or email The Shattow Group.